Microïds and Frima Studio have announced that Super Chariot will receive a physical release in Europe and Australia. 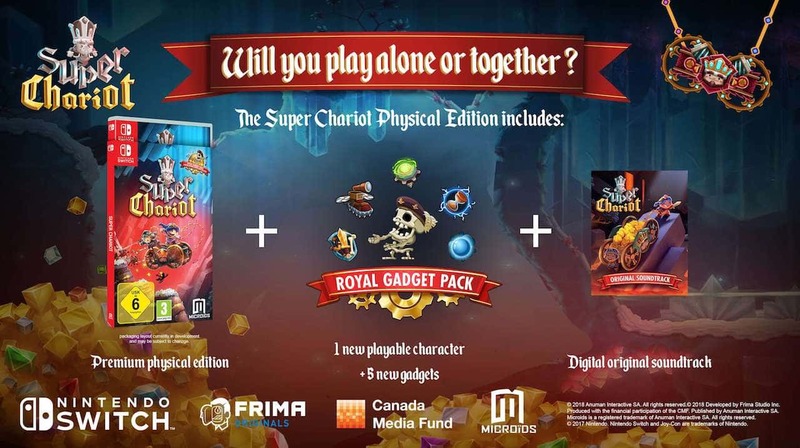 This will include a physical copy of the game, the Royal Gadget Pack downloadable content that adds one playable character and five new gadgets, and the digital soundtrack. In Super Chariot, you take on the role of the princess or her fiancé as they carry the coffin of the deceased King in search of a resting place that he deems worthy. You will need to have your wits about you as you move the chariot through 52 colourful levels, and, while the game can be played solo, it’s far better suited to playing with another player co-operatively. Super Chariot will release at retail and on the Nintendo eShop for Nintendo Switch in May 2018, with a demo to become available soon.